Turkey, stuffing, and cranberry sauce are synonymous with the Thanksgiving holiday. But around the country, a new tradition has begun to take shape, and one that is much more calorie friendly. For many, Thanksgiving Day has become a race day, with morning turkey trots kicking off the holiday festivities in cities nationwide. Delaware County will host two such events Thursday in Delaware and Powell. Delaware’s New Beginnings Church will host the city’s seventh annual Turkey Trot 5K Run and Walk, which will begin at 8:30 a.m. behind the Office Max and Kohl’s at Glennwood Commons on Sunbury Road. The Little Gobbler kids run will begin the day, led by “Gobbler,” the turkey mascot. Ages 5 and under will have a 200-yard course to complete, and children ages 6-8 will have a 400-yard course. A finisher’s medal and other goodies await the children who complete the course. The 5K will begin following the kids races at approximately 8:40 a.m. All participants will receive a medal and a pumpkin pie. The top three male and female finishers will also receive an award. Registration is still open for the event, and participants will be able to register through Wednesday. There will be no day-of-race registration available. Registration fees are $44 for the 5K and $15 for the Little Gobbler kids run. Children may participate in both races and only need to be registered for the 5K to do so. To register, visit www.delawareturkeytrot.com and follow the register link at the top of the page. Once registered, racers can pick up their race packets at New Beginnings Church, located at 385 E. William St., through Wednesday during three time periods: 6:30-8:30 a,m., 11 a.m.-1 p.m. and 4-7 p.m. There will be no race-day packet pick-up. If racers are unable to pick up their packets during those times, they may send a family member to pick up the packet. Packets include custom Turkey Trot socks, a shirt and race bib. A course map will be included in the packet and can also be found on the event’s website. New Beginnings has donated 100 percent of the proceeds from the race to the Autism Society of Central Ohio over the past six years, which has totaled $93,000. Thursday’s event will push that total over $100,000. Last year’s race saw more than 1,350 people participate and Jake King, a member of the church’s race team and the youth and community relations pastor, expects a similar showing this year. Meanwhile, the city of Powell will host the fifth running of its own Turkey Trot, which will begin at Village Green Park with the “Wobble till you Gobble” kids fun run at 8 a.m. The kids run will stretch .25 miles and will be contained within the park. Finishers will receive a shirt, snack and an award. Afterward, at approximately 8:30 a.m., the four-mile Turkey Trot will begin. 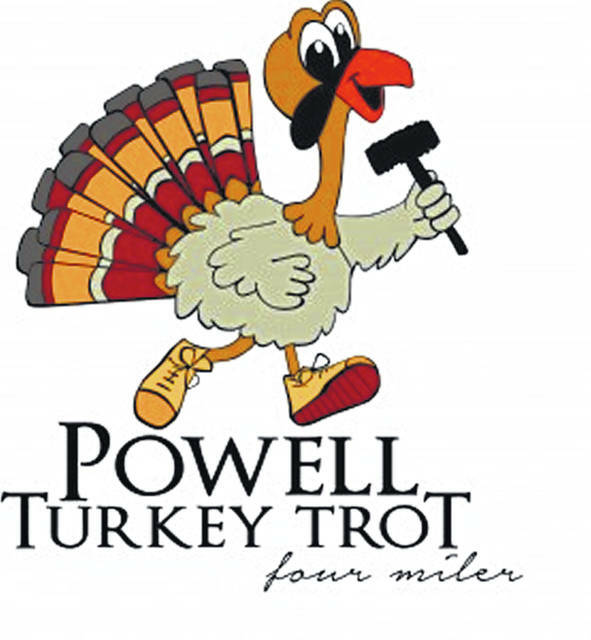 To register online, follow the link at www.powellturkeytrot.com. Registration cost is $50, and today is the last day to register online. No registrations will be accepted on race day. However, if the event is not yet sold out, registration can be done during the packet pickup on Wednesday. The packet pickup will be held at Bridgewater Banquet Center, located at 10561 Sawmill Pkwy., from 10 a.m. to 8 p.m. Upon completion, participants 21 years and older will receive a large bottle of Sideswipe Brewing’s fall beer offerings. Those under the age of 21 will receive custom socks. For those who are looking to compete, there will be $1,450 in prizes given out to the top performers. The top male and female finisher will receive $300. The second-place male and female will receive $200. Third-, fourth-, and fifth-place finishers will win $100, $75 and $50. Sixth-, seventh-, and eighth-place finishers will receive a free entry into next year’s event. Like the event in Delaware, the Powell Turkey Trot hopes to have a positive impact on the community. Prior to the race, beginning at 7:15 a.m., there will be a book drive in which books and magazines will be accepted. They can also be donated during packet pickup. Books and magazines should be in good condition and appropriate for ages 1-17. A financial donation will also be made to the central Ohio chapter of A Kid Again, an organization that helps families who care for a child with life-threatening illnesses. Reach Dillon Davis at 740-413-0904. Follow him on Twitter @ddavis_gazette.